This week, Aug. 3 to be precise, marked the day the old Moorestown Town Hall caught fire and was rendered unusable eight years ago. This year marked the first anniversary of the Moorestown Library and Town Hall joint complex being open. The construction of the library and Town Hall was one of the biggest projects the town took on in the past 10 years. However, it ended with an aesthetically pleasing, more advanced and convenient structure for both township workers and residents. “I’m thrilled with it. The building reflects the community that is Moorestown, and the team responsible understood what we were looking for. We achieved all goals we set out to achieve, and I hope the building will serve as an important landmark for generations to come,” Township Manager Scott Carew said. “The town is very lucky to have a community that backed a project like this one and continues to support and come here. Moorestown is a great place to live. The administration and council that helped to put this together have been great. Everyone pulled together for the common good,” Library Director Joseph E. Galbraith said. The fire in the old Town Hall occurred on Friday, Aug. 3, 2007. The cause of fire was never established, but it was determined to originate in the second-floor kitchen, according to CFO Tom Merchel. The township got together and relocated many of the offices to the old library, where it stayed six months and then moved to 2 Executive Drive as a temporary location. Before the fire, the library was looking to renovate and expand its 1975 building. After the fire, it gave the township an opportunity to step back and reexamine the entire municipal complex. After years of discussion and a few different township councils, approval was given for a joint library and Town Hall. In fall 2011, the old Town Hall was demolished, and in December 2012, construction on the new joint library and Town Hall began. The Ragan Design Group developed the plans for the building, Greyhawk Construction provided project management, and Sambe did the construction. The final cost of the building came to $16.2 million, which included the expenses for the first design and moving costs. 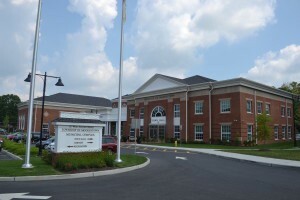 The township received the temporary certificate of occupancy on May 16, 2014, for Town Hall, but the official grand opening of the building did not occur until the library was completed on July 8, 2014. “It’s so surreal. It is hard to believe we have been here a whole year,” Galbraith said. With the new library and Town Hall, the township wanted to have a building that fit the character of the town, was aesthetically pleasing and was up-to-date. “I think that what we accomplished was something that really fits, makes sense and is worthy of a Moorestown Library and Town Hall,” Carew said. The building itself has large windows for natural lighting, high ceilings, comfy furniture and sizable spaces. 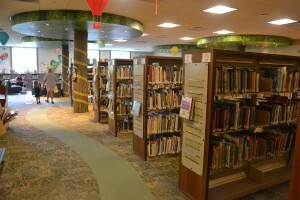 The library also offers an area specifically for children that has a fun look and feel. A special feature is its large columns, painted like trees by an artist, all paid for by donors. Having the building combined also has many benefits for the Town Hall, library and citizens themselves. The new Town Hall makes it convenient for citizens to accomplish their municipal tasks in one place. Also, the library and Town Hall share meeting spaces, IT and janitorial services and a HVAC system, saving on costs. An unforeseen benefit is the library has seen more traffic. Residents with business at Town Hall stop by the library because they are there. Since its opening, the library has registered more than 1,500 library cards, and that number continues to grow. Advancement with technology was made in the new building to make it more efficient, which the older buildings didn’t have. The library has state-of-the-art audiovisual systems, high-speed wireless Internet, desktop computers and televisions. At Town Hall, much of the advances can be found at the council chambers with its hookups for laptops to audiovisual components, eight large screen TVs, a large pull-down screen to broadcast slideshows or videos and a new audio system. There are also some unseen advancements residents may not know about. According to Galbraith, the HVAC system filters the air and processes it with UV light to kill viruses and bacteria in the air. Also, the building is a green building. On the roof there are solar panels, a garden and a system to collect rainwater. “There are things going on behind the scenes that make the building cost effective and sustainable that people may not see,” Carew said. For the future, the library is interested in adding a café with a service counter, kitchen and tables and chairs for visitors to enjoy a light snack or drink. Technology-wise, the township is working to get a TV station so it can have the ability to broadcast videos and meetings. However, most importantly, Carew said what they need to be sure of in the future is to maintain the building and make sure it doesn’t fall into poor condition, so it stays for generations to come. As for the old library, plans are to demolish it and use the land for green space. According to Carew, the township will go out to bid for that job sometime in August and hopefully have it start to come down this fall.